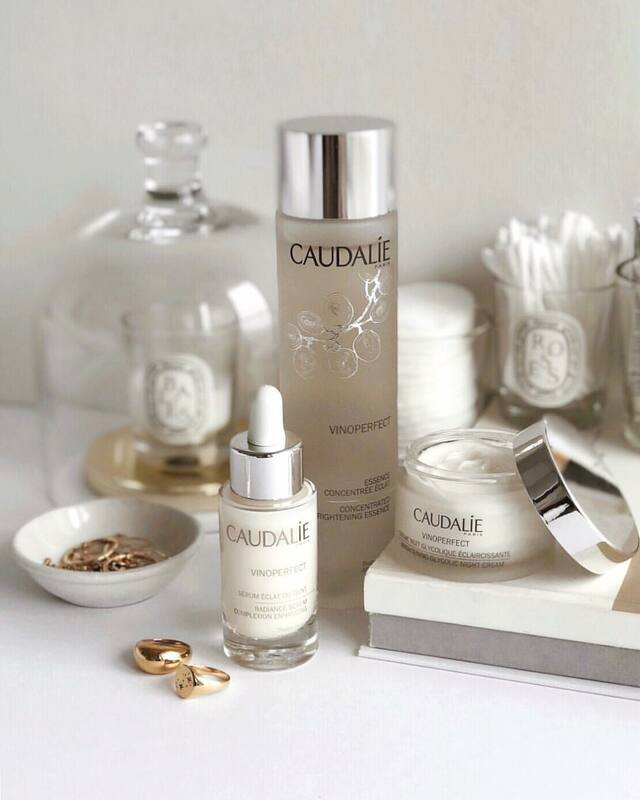 The new Caudalie Vinoperfect Brightening Glycolic Night Cream is shockingly GOOD. After taking a months long hiatus from moisturizer, I decided to reenter the world of lotions and creams with this one by Caudalie and I’m so happy I did. After just a few nights of using this cream, my pigmentation has drastically faded, my overall skin looks brighter and the texture appears plumper. This morning my husband even looked at me and said – which he never says – “You are so beautiful, and your skin looks so pretty this morning.” I stared back at him in disbelief and said, “Is this a joke?” Obviously you can tell from my reaction he’s not one for compliments, but he insisted I looked radiant. When I peered in the mirror, I had to agree. My skin did look good. My next move obviously was to run to my computer to write up this review to share on the blog! How it works: First off, when a skincare brand uses patented technology in their products that’s usually a big hint the brand is going to offer efficacious skincare. It signifies the brand has labs, done clinical studies, and is offering something completely new to the market, not just something repackaged and advertised as “new” and groundbreaking. Which is probably why Caudalie’s Vinoperfect Brightening Glycolic Night Cream works so well. It utilizes their patented Viniferine complex – derived from isolating and stabilizing a molecule in grapevine stalks that is able to control tyrosinase; the enzyme present in plant and animal tissues that catalyzes the production of melanin. This stellar ingredient discovered by Caudalie has been found in studies to have 62x the efficacy of vitamin C when it comes to targeting and reducing pigmentation. It also has been shown to be a potent antioxidant preventing free-radical damage and boosting microcirculation. So the Viniferine is the main star of this show, but it’s the addition of exfoliating glycolic acid and papaya enzymes that gives it the kicker – smoother texture and fast lightening of existing pigment. I’ve recently become a huge fan of glycolic acid, but it can be a little scary for those who have been burned before. What makes this cream such a standout among other glycolic acid creams is that they combine the glycolic acid with an arginine amino acid to slow down the release of the glycolic acid in the skin! This makes it more suitable for sensitive skinned peeps like myself! Then to top it all off this cream is extremely hydrating without any heaviness! Review: If you can’t tell already, I am OBSESSED with this cream. After I went a month without using moisturizer I really thought that I may never go back to using it. I’m glad I did. This cream is exceptionally light and deeply nourishing at the same time. It delivers on its promises to brighten and fade pigment and it gives my skin a plump overall glow. Now all I’m waiting for is for them to launch a Vinoperfect Day Cream. Scent: All of the Caudalie products in the Vinoperfect line have a gorgeous grape-citrus scent. Light, but noticeable. Tip: Use a little on your neck and décolleté! I’ve found it works well at smoothing neck bands.